Natural form of Vitamin E.
Associated with decreased skin ageing and a more effective immune system. Our dietary supplement Natural E has been developed to provide a natural, active form of vitamin E. Essential for good health, this fat-soluble molecule offers many health benefits, including significant antioxidant potency. It exists in Nature in various forms. Eight distinct molecules have been identified, four of which are tocotrienols and four tocopherols. Alpha tocopherol is the most biologically active of these forms; it is preferentially absorbed and accumulated by the body. However, this natural form is not the most abundant in the human diet which is why supplementation with alpha-tocopherol may be of benefit in helping the body function optimally. cell membranes, including those in the skin, which helps combat ageing of the skin and cells. Although vitamin E is present in foods such as vegetable oils and nuts, intake can sometimes be inadequate. Poor dietary habits may result in a lack of vitamin E, in which case supplementation may be necessary to restore normal levels in the body. Meeting daily requirements for vitamin E is all the more important since a lack of this vitamin can lead to certain metabolic dysfunctions. The first signs of deficiency are usually a burning sensation and pain in the hands and feet. Without proper diagnosis and suitable treatment, vitamin E deficiency can lead to more serious problems such as disorders of the immune system, retina and neuromuscular system. In addition to preventing or correcting deficiency, vitamin E supplementation may have a number of therapeutic applications. It has attracted scientific interest because of its antioxidant potency, which helps combat oxidative stress and free radical damage. Vitamin E thus offers protective effects against cellular ageing which is why it is often highlighted for its anti-ageing effects, particularly ageing of the skin. Its antioxidant power also helps prevent the development of age-related disorders including cardiovascular problems and neurodegenerative diseases such as Parkinson’s and Alzheimer’s. Research is ongoing to improve our understanding of vitamin E and evaluate the extent of its potential. Some studies have already indicated it has other health-beneficial properties such as immune-stimulant, anti-inflammatory, anti-platelet and vasodilatory properties. 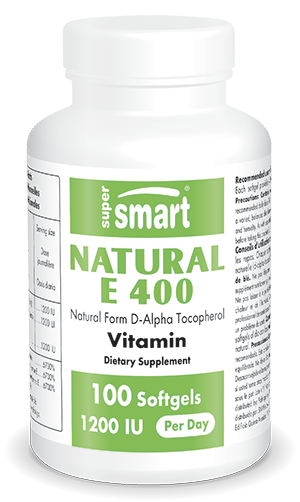 A high-quality dietary supplement, Natural E has been developed from a natural, active form of vitamin E: d-alpha tocopherol. Studied extensively, this form has proven bioavailability and efficacy in the body. To offer maximum benefits, this natural vitamin is encapsulated in softgels, each capsule containing 400 IU. This means the recommended dose is one to three capsules a day, to be taken at mealtimes, though this dose can be adapted to your needs and the advice of your therapist. In addition to Natural E, you may also be interested in the other forms of vitamin E offered in our catalogue: Annatto Tocotrienols and Gamma E Tocopherols. Each softgel provides 400 International Units of natural-source vitamin E.